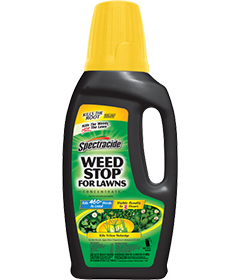 Spectracide® Weed Stop® For Lawns kills all types of listed broadleaf weeds including dandelion, chickweed, clover and yellow nutsedge. This product treats bluegrass, fescue, zoysia*, Bermuda and perennial ryegrass. For best results, apply between 45 degrees and 90 degrees. Above 45 degrees Fahrenheit, the better the weeds will be able to absorb the product. 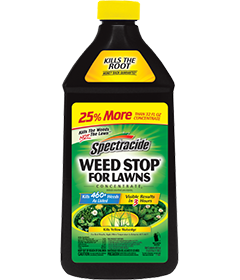 Spectracide Weed Stop For Lawns Concentrate2 kills by contact and kills weed roots. Controls 460+ weeds as listed, giving you visible results in 3 hours. When used as directed, this product kills the weeds, not the lawn™. *Do not apply to zoysiagrass just emerging from dormancy. THIS PRODUCT CONTAINS: 0.54 lb 2,4-D acid equivalent per gallon or 6.31%; 0.19 lb Mecoprop-p acid equivalent per gallon or 2.25%; 0.05 lb Dicamba acid equivalent per gallon or 0.59%; 0.02 lb Sulfentrazone per gallon or 0.18%. Isomer Specific by AOAC Method. Do not apply this product in a way that will contact any person or pet, either directly or through drift. Keep people and pets out of the area during application. Do not allow people or pets to enter the treated area until sprays have dried. Do not allow spray to drift onto desirable plants since injury may result. Do not apply as a ﬁne mist because of potential for injury to desirable plants. Do not apply when windy. Do not treat when air temperatures exceed 90°F as damage to grass may occur. Application at rates above speciﬁed on this label may cause injury to turfgrass. Do not use on ﬂoratam or bitterblue varieties of St. Augustinegrass. Do not use on carpetgrass, dichondra, lawns with desirable clovers or legumes, vegetables, fruits or ornamentals. Do not spray exposed roots of ornamentals and trees. Do not apply more than two applications per year. You must wait at least two weeks between applications. Not for use on turf being grown for sale or other commercial use such as sod, or for seed production, or for research purposes. Do not apply directly to or near water, storm drains, gutters, sewers or drainage ditches. Do not apply within 25 ft of rivers, ﬁsh ponds, lakes, streams, reservoirs, marshes, estuaries, bays and oceans. To prevent product runoff, do not overwater the treated area(s) to the point of runoff or apply when raining or when rain is expected that day. Rinse applicator over lawn area only. **Do not apply to zoysiagrass just emerging from dormancy as it may result in lawn damage. ***Do not use on ﬂoratam or bitterblue varieties of St. Augustinegrass. Do not use this product on carpetgrass, dichondra, legumes or lawns containing desirable clovers. The maximum application rate is 4 ﬂ oz of product per 1,000 sq ft per application (0.74 lb 2,4-D acid equivalent per acre per application). The maximum number of applications is limited to two per year. The maximum seasonal rate is 8 ﬂ oz of product per 1,000 sq ft (1.48 lb 2,4-D acid equivalent per acre), excluding spot treatments. Apply when daytime temperatures are between 45°F and 90°F. Do not apply to zoysiagrass just emerging from dormancy. Spring: Spray when broadleaf weeds are young and actively growing with adequate soil moisture for best results. Fall: Spray when broadleaf weeds are young and actively growing with adequate soil moisture for best results. Fall applications will control weeds that may otherwise go dormant through the winter and resprout the following spring. Early summer: Two applications of this product are required when the yellow nutsedge plants are 3 to 6 inches tall. Apply the second application at the same rate at 14 days later. Spring: Apply when dandelion, plantain, buttercup, speedwell, knotweed and other listed broadleaf weeds are young and actively growing with adequate soil moisture for best results. Fall: Apply when henbit, chickweed, white clover, ground ivy, lawn burweed and other listed broadleaf weeds are young and actively growing with adequate soil moisture for best results. Fall applications will control weeds that may otherwise go dormant through the winter and resprout the following spring. See the following table for calculating the correct amount of product to use for the area to be treated. The maximum application rate is 4 ﬂ oz of product per 1,000 sq ft per application (0.74 lb 2,4-D acid equivalent per acre per application). The maximum number of broadcast applications is limited to two per year. The maximum seasonal rate is 8 ﬂ oz of product per 1,000 sq ft (1.48 lb 2,4-D acid equivalent per acre), excluding spot treatments. MEASUREMENT CALCULATIONS: Total lawn area in square feet = length x width. Do not use a hose-end sprayer to spot treat. To spray small areas or individual weeds, use a pressure sprayer for better control. Mix the indicated amount of product listed below. Shake well before spraying. Be certain to wet each weed. ***Do not use on ﬂoratam or bitterblue varieties of St. Augustinegrass. **Do not apply to zoysiagrass just emerging from dormancy. Calculate the total lawn area to be treated. This is done by multiplying the length of the area by the width to obtain total square feet. Prepare only enough spray solution to treat the area calculated. Prepare the spray mixture according to the chart below. Carefully measure the proper amount of product to treat 500 sq ft. If more or less than 500 sq ft is to be treated, adjust the amount of product accordingly. Shake the spray solution before and during application. Use a spray pattern that gives small droplets without any ﬁne mist. 1,000 sq ft of lawn. Set dial on sprayer to the setting from the chart below. Attach sprayer to garden hose. Extend hose to the farthest area of lawn to be treated and work back toward faucet so that you do not walk over treated areas. Apply evenly to lawn. Unused product can be returned to the original container when completed. EXAMPLE: For Kentucky bluegrass: To treat 1,000 sq ft of lawn, measure 4 ﬂ oz of product into sprayer jar. Do not add water. Set dial on 4 Tbsp and spray uniformly. Check the directions you received when you purchased your sprayer for further details on the proper use of your dial sprayer. Directions are calculated assuming hose-end sprayer is used to spray about 2 gal of water/product mixture per 1,000 sq ft.
From the following chart, determine amount of concentrate required to treat each 1,000 sq ft of lawn. Calculate square feet by multiplying length by width. Pour concentrate into sprayer jar to the required “fl oz” level. Add the appropriate amount of water to the “gallons” level. Replace sprayer top on jar and shake well before spraying. Attach sprayer to hose. Extend hose to the farthest area of lawn to be treated and work back toward faucet so that you do not walk over treated areas. Apply evenly to lawn. **Do not use on ﬂoratam or bitterblue varieties of St. Augustinegrass. EXAMPLE: To treat 1,000 sq ft of fescue, pour in concentrate to the 4 ﬂ oz mark and add water to the 2 gal mark. Check the directions you received when you purchased your sprayer for further details on the proper use of your sprayer. Some hard-to-kill weeds may require re-treatment. Wait at least two weeks between applications — some weeds can take that long to die. Spray during growing season when weeds are actively growing. For best results, mow lawn two to three days before treating weeds. To avoid risk of lawn injury, do not spray drought-stressed lawns. Watering immediately after treatment may wash away effectiveness. Wait until newly seeded grass is well-established or after the third mowing before applying this product. Treated areas may be reseeded three to four weeks after application. Adjust nozzle to produce a coarse spray. Coarse sprays are less likely to drift. Avoid ﬁne mists. Application to zoysia lawns when they are emerging from dormancy in the spring may cause damage. Overapplication, especially at 90°F or higher, may cause damage. Application to Bermudagrass may cause temporary yellowing when applied at 90°F or higher, but full recovery can be expected. Do not contaminate water, food or feed by storage and disposal. Pesticide Storage: Store in a cool, dry area away from heat or open ﬂame. Pesticide Disposal and Container Handling: Nonreﬁllable container. Do not reuse or reﬁll this container. If empty: Place in trash or offer for recycling, if available. If partly filled: Call your local solid waste agency for disposal instructions. Never place unused product down any indoor or outdoor drain. CAUTION. Harmful if swallowed. Wash thoroughly with soap and water after handling and before eating, drinking, chewing gum, using tobacco or using the toilet. If swallowed: Call a Poison Control Center or doctor immediately for treatment advice. Have person sip a glass of water if able to swallow. Do not induce vomiting unless told to by a Poison Control Center or doctor. Do not give anything to an unconscious person. Have the product container or label with you when calling a Poison Control Center or doctor, or going for treatment. You may also contact 1-800-917-5438 for emergency medical treatment information. This pesticide is toxic to ﬁsh and aquatic invertebrates and may adversely affect non-target plants. To protect the environment, do not allow pesticide to enter or run off into storm drains, drainage ditches, gutters or surface waters. Applying this product in calm weather when rain is not predicted for the next 24 hours will help to ensure that wind or rain does not blow or wash pesticide off the treatment area. Rinsing application equipment over the treated area of the lawn or garden will help to prevent runoff to water bodies or drainage systems. This chemical has properties and characteristics associated with chemicals detected in groundwater. The use of this chemical in areas where soils are permeable, particularly where the water table is shallow, may result in groundwater contamination. Application around a cistern or well may result in contamination of drinking water or groundwater.